No theme post or book review today. Just some stream-of-consciousness musings from the past few days. I'm continuing my current espionage craze. 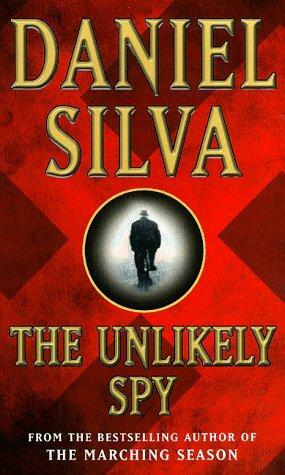 I'm probably the last person to read Daniel Silva's The Unlikely Spy, from 2003, but better late than never. This historical thriller pits university don Alfred Vicary, now with British intelligence, against the Nazis' sleeper agent, Catherine Blake. Vicary's task is to implement plans to trick Germany into thinking that the D-Day invasions will come at Pas de Calais and Norway, rather than Normandy. Blake's orders are to find out the Allies' invasion plans––and avoid getting caught by those who suspect the Nazis have an agent on the case. This is a real ham sandwich of a story, a guilty pleasure filled with action, over-the-top melodrama and plenty of cheese and mustard. Some of the writing may cause heartburn (how can somebody glare without any expression in his eyes? ), but there is thrilling storytelling on display. I can't say much for the audiobook narrator, but he's not actually painful to listen to. You know you might be reading too much espionage when somebody starts chatting with you via comments on your book reviews on Amazon and your mind leaps to wondering how book review comments might be used to pass secret messages. Della's review of The 100-Year-Old Man Who Climbed Out the Window and Disappeared grabbed my interest and I downloaded the audiobook. What a piece of inspired silliness! It's a charming yarn, a bit of a shaggy dog story, and the perfect selection to put a smile on your face. Now I need to move on to the next book inspired by my colleagues here on Read Me Deadly. Periphera's review of Murder at the New York World's Fair inspired me to request that chestnut from interlibrary loan and I'm excited about reading it––even though the copy I received is a beat-up old paperback with a completely out-of-whack spine. It should make a nice change of pace from my other ILL books: Anne Applebaum's Iron Curtain: The Crushing of Eastern Europe, 1944-1956 and Lawrence Wright's Going Clear: Scientology, Hollywood, and the Prison of Belief. I've mentioned before that one of my guilty pleasures is watching TV crime dramas. There are many recycled plots that make me roll my eyes, but there's one that I just can't stand, and that's kidnapping, taking hostage or otherwise threatening the protagonist's family members. Well, it must be February sweeps, because we have the teenage daughters of the protagonists in two TV crime dramas kidnapped. Yes, this is the cheap melodrama featured in both Body of Proof and a two-parter on Castle. My eyes aren't just rolling, they're at full spin––and you could get scorched from the steam coming out of my ears. I wrote last September about my annoyance at having to wait for British crime fiction to be published in the US. Now I'm grumbling about British TV crime drama. Britain's ITV recently completed filming on a new police procedural series called Broadchurch, starring David Tennant, the marvelous actor who played the 10th Doctor Who (and my favorite) from 2005 to 2010. Broadchurch will begin next month in the UK. Supposedly, we'll get it in the US on BBC America sometime later this year, but I don't know when. Why must I wait?! UK viewers will also shortly get to see a miniseries based on Kerry Greenwood's Phryne Fisher mystery series. It was produced in Australia and shown there last year, and a second series will begin airing there shortly. As far as I know, there is no US telecast scheduled, though Acorn has purchased the rights to distribute the DVDs in the US. You Downton Abbey fans know this frustration. That bang-up finale that US viewers saw on February 17 was telecast in the UK on Christmas Day, and spoiler-y comments about it have been all over the internet since then. I keep seeing promotions for a new ABC show called Red Widow that premiered earlier this week. I couldn't figure out from the promos what the heck it was about, but I finally looked at the show's web page and see that it's about Marta, a woman who "has tried to stay out of her father's world of organized crime, but everything changes after her loving husband is brutally murdered." Guess what ethnicity her father's gang is? If you read my post here, then you will know to buzz in and say "What is Russian, Alex" for the Daily Double answer. "I had observed that men did not usually do things unless they liked doing them." "I did part-time work at an organization that helped impoverished gentlewomen, a cause very near to my own heart, as I felt that I was just the kind of person who might one day become one." "I was a little dismayed, as we often are when our offers of help are taken at their face value." "Virtue is an excellent thing and we should all strive after it, but it can sometimes be a little depressing."